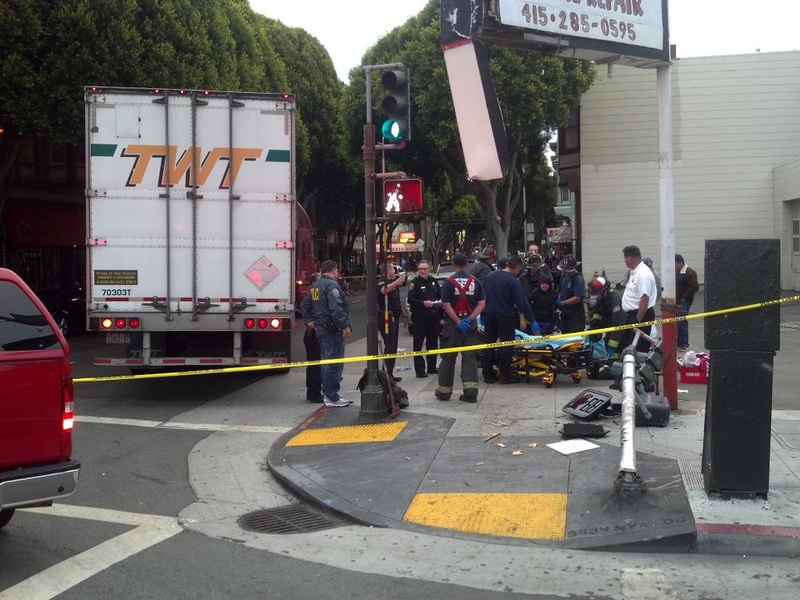 Four girls between the ages of 9 and 14 were injured at South Van Ness Avenue and 24th Street in the Mission yesterday after the driver of a semi truck knocked down a traffic light pole, which fell onto the victims, according to police. 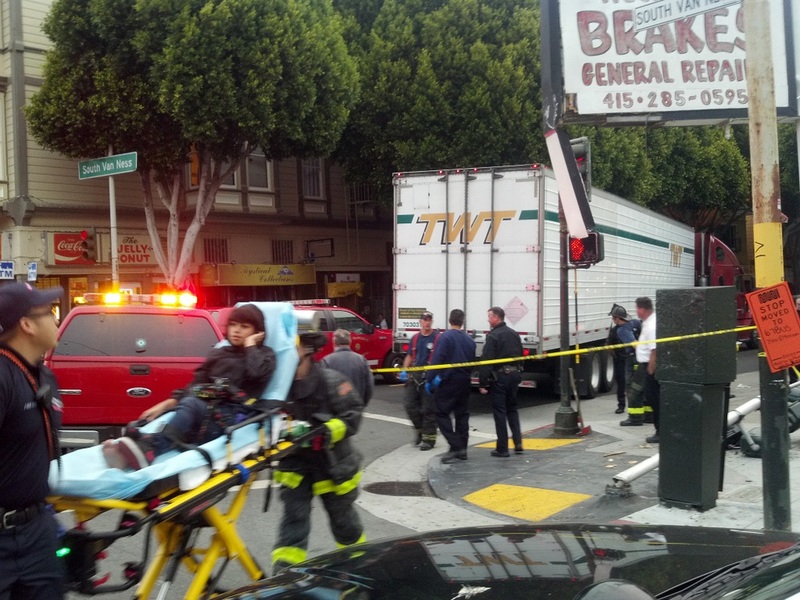 The crash occurred at about 7:15 p.m. as the truck driver was making a right turn from South Van Ness on to 24th. According to the SF Appeal, “a car came into his path, causing him to cut his turn short and hit the traffic signal pole.” The girls’ injuries, which include a broken leg and arm lacerations, aren’t considered life-threatening, according to SFPD. The girls were taken to SF General Hospital. About 50 people were standing nearby watching the aftermath, many of them Latino families. “Everyone looked very sad and tense seeing the poor young girls injured while simply walking on the sidewalk,” Marc said. Walk SF Executive Director Elizabeth Stampe said crashes like these highlight the need for City Hall to take swift action to implement the SF Pedestrian Strategy. Why is that semi even turning onto 24th? If a semi truck has a choice between hitting a car or going up on the sidewalk, they should choose hitting the car, especially in a heavy pedestrian area like 24th street. The person in the car is far better protected than anyone on the sidewalk. Have to agree that semi’s don’t belong on 24th street and also that truck drivers should drive slowly enough in high congestion areas that they are easily able to stop for errant cars/children/pedestrians/bicyclists that might be about. That truck shouldn’t have been making that turn faster than 5 mph. Agree with the point about the term “accident” – a lot of us use that reflexively, but it’s often not accurate. At a minimum, “incident” is good to say when facts are still in flux. Of course it was an accident. A theoretically preventable event can still be accidental: it wasn’t intentional. Was Marc suggesting to the officer that the driver deliberately hurt those girls? The driver appears to have made a decision to keep going despite being cut off by another car (or whatever our interpretation of the situation is). That’s an accident like you have when you decide to keep driving despite those 5 drinks you just had. He “accidentally” was driving either too fast or not carefully enough to keep the truck in control. I know these little girls it was wrong for the driver to be turning like that on 24th n south vann ness!! Thats illegal. Those little girl were not at fault. They are innocent children who were hurt badly for a adults mistake. So sad. To combat the institutional windshield bias, there needs to be a directive from high up in the police department to stop referring to these as “unfortunate accidents”. An unfortunate accident is when you have a heart attack and you hit someone. An unfortunate accident is when your tire blows in a bad way causing you to lose control of the vehicle. Until an incident is determined to have been an unfortunate accident after an investigation it should not be referred to as such. After a while the messaging will sink in and police officers will change their perspective if only a bit, increasing street justice. Im one of the girls im the one on the bes and thanks everyone for all the support!! When something like this happened some people here love to make conclusions with little facts available. What I can say in general is that a lot of car drivers have little respect for semi and even bus drivers and choose not to give room for these vehicles to make wide turns, or attempt to pass on the right as these vehicles are making a right turn. No, Roy, the opposite of “accident” is “deliberate”. That maniac who drove down Venice Beach boardwalk the other day did that deliberately. Nobody is saying this truck driver is in the same category. Of course, within the category of “accident” there is a range of possibilities. Drunkeness, as you indicate, constitutes extreme negligence and would lead to conviction. Texting, less so perhaps but still a proximate cause. But what about a sudden sneezing attack, or something flying in your eye? Or, as in this case, and evasive manoever to avoid perhaps a more serious collision? The more egregious cases of negligence will lead to a prosecution, but genuine accidents should not. Except in this case there was no collision, assuming that you mean two vehicles hitting each other. Indeed the truck driver was trying to avoid a collision. Nor did he collide with the children. He hit a post which hit the children. Karen, I think that is true but only when there is time for a rational deliberation before the need to take action. But in a genuine and sudden accident scenario, such as a vehicle coming right at you, it is instincts that take over and, as a driver, my instinct is always to try and execute a lateral move, and usually to the right as that is where there is no moving traffic. I defy anyone tobhonestly claim that they would just carry on and ensure a head-on collision, especially with a larger fast-moving vehicle, when a swerve would avoid an impact. The semi truck was by far the larger vehicle. The driver could be certain that the semi would take little damage in a low speed (under 20mph) collision with car. For a professional driver, such as the person driving a semi truck, training should be sufficient to substitute for instinct. And if the driver were taking this turn at reasonable speed for the situation (large, heavy truck in a tight turn in a dense, inner urban neighborhood), in other words, at 5 mph, there would’ve been much more time to 1) react and 2) stop before any kind of collision was necessary. There is every reason to expect professional drivers to drive more cautiously and better than people who don’t drive for a living. Again, for the safety of everyone not in a car, no truck driver driving through San Francisco should ever choose to swerve up onto a sidewalk to avoid a low speed collision. And speeds should be kept low enough in dense, congested areas so that all collisions are no more than low speed. Wayne, even the New York police department has recognized that the use of the term accident is not appropriate when describing traffic collisions: http://www.nytimes.com/2013/03/11/nyregion/collision-replacing-accident-for-nyc-police-traffic-crash-squad.html?_r=0. And I ask you – why do we not refer to plane crashes as ‘accidents’ then? I doubt you’ll see any public official discussing the plane crash that took place several weeks ago as a ‘tragic accident’. Therefore he collided with an object. It’s a collision. It was an accidental collision? Police should all have to walk a beat instead of sitting in their squad cars all day. I don’t think the driver swerved at all. The driver took the corner too shallow (impending collision or not, I put money on not) and the rear tires hopped the curb and clipped the poll. Also, be wary of any first name monikers that aren’t attached to an actual DISQUS profile. This Wayne fellow sounds oddly familiar to Neil. He won’t add to the discussion but rather keep making you run around in circles. lol, how is your comment not making conclusions with little facts available? The only comments I’ve read are about how people should be driving vehicles in a dense area slow enough to avoid such types of collisions and that there is an inherent language bias in calling collisions or crashes “accidents.” But please, keep scolding us for our misguided ways. Is that a fact? Or just a conclusion you are making with little facts available? Aaron, have you tried engaging in a debate rather than trying to censor anyone who disagrees with you? Changing the name in which you post regularly distracts from whatever debate you think you are having. Take it back to SFGate. I frequently see air crashes referred to as accidents, most recently the accident at SFO. Just because someone can be found at fault, as we believe the Asiana pilots may be for the recent accident at SFO, that doesn’t mean that the incident was somehow deliberate. South Van Ness Ave is the scene of so many serious accidents/fatalities. Why isn’t MTA redesigning this street for safety? I hope you are okay. Pretty scary! Large delivery vehicles should not be driving the streets during peak hours of 8:00-18:00. Outside of then, sure ok. But within those hours, they should use smaller delivery vehicles. To trim the tree branches overhanging the street. If you are a friend make sure they visit an attorney to explain then their rights. Best of luck.